Episode 3: "Rest in Pain"
Cooper relates his dream and attends Laura’s funeral; Dr. Hayward fights with Albert; Laura’s cousin Madeleine arrives in town; Norma’s husband comes up for parole. the truth. So sadness, in our ignorance, is very real. This episode opens on the morning of Monday, February 27, 1989. After Cooper confirms with Audrey that she's the one who slipped the note under his door about One-Eyed Jack's, he asks her, "What is One-Eyed Jacks?" But he already knows the basics of the place, as Sheriff Truman told him about it in Episode 2: "Zen, or the Skill to Catch a Killer". Cooper tells Audrey that the rightward slant of her handwriting indicates a romantic nature. The study of handwriting is called graphology and supporters claim that it can reveal the personality traits of the writer. I have not found any particular documentation stating that a rightward slant indicates a romantic nature as stated by Agent Cooper; it is generally said to denote someone who is confident and assertive. Audrey tells Cooper that her father named his department store after himself, Horne's Department Store. But, both Twin Peaks: An Access Guide to the Town and The Secret History of Twin Peaks state that the store was built by his grandparents as Horne's Department Store. As Truman and Lucy approach his table, Cooper dismisses Audrey and tells the waitress, Trudy, they'll need two more coffees, and it's clear he already has one. But he entered the restaurant without one and no waitress or waiter came by while he was talking to Audrey! When Cooper describes his dream to Truman and Lucy, it has details we the viewers did not see in Episode 2: "Zen, or the Skill to Catch a Killer"; these extra details are all part of the "extended dream" I discussed in the study of that episode, from the last twenty minutes of the European Twin Peaks video release, a modified version of the two-hour pilot. Cooper's description of how dreams form is roughly accurate. In the split-second between 7:40 and 7:41 on the Blu-ray, Cooper's breakfast has magically arrived. Then Cooper pours maple syrup on his griddlecakes, but notice that nothing actually comes out of the pitcher! Ben Horne refers to Albert as "Mr. Rosenfeld" instead of "Rosenfield", his proper name. The blood splatters on Albert's lab coat change from shot-to-shot in the morgue scene. As Leland watches Invitation to Love on TV, it introduces us to Chet, Jared Lancaster, Montana and the sisters Emerald and Jade. It's never revealed whether the sisters are twins or just similar-looking. Of course, the parallel with the characters of Twin Peaks itself is that Laura and Madeleine (introduced in this episode) are nearly-identical cousins. Note that both sisters are named for green-colored stones. Could there be a motif of the color green in Twin Peaks? Of course, there is the green of the woods around the town, but there is also the green stone of the Owl Cave ring and the Dwarf specifically comments on the green color of the formica table in the room above the convenience store in Fire Walk With Me. It looks like the Palmer television is on channel 3 as it shows Invitation to Love. Channel 3 is often the one used to present video from an external transmitting device such as a VCR (in the days before "external input" options in televisions), so the scenes of Invitation to Love were probably being piped to the set from a playback device to the TV on the shooting stage. On Invitation to Love, Jared, the father of Emerald and Jade, writes a suicide note to his daughters. Leland watches the scene intently. This may be a hint that Leland himself was contemplating suicide after the death of his daughter. Laura's lookalike cousin, Madeleine Ferguson, is introduced in this episode just as the identical sisters Emerald and Jade are introduced on the television in Invitation to Love. Cooper is delighted at seeing ducks on the lake behind Leo's house. Is it Black Lake? At 14:13 on the Blu-ray, a Volkswagen Beetle can be seen parked near another house behind Leo as he chops wood. It looks similar to the one driven by waitress Heidi at the RR in Episode 0A: "Wrapped in Plastic"...maybe she lives across the street from the Johnsons! 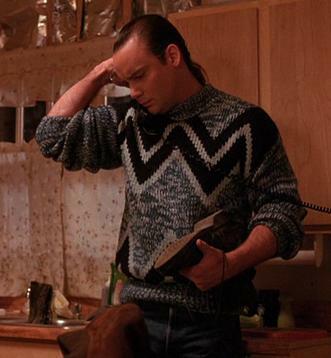 Leo tells Cooper and Truman that he called his wife, Shelly, from Butte, Montana the night of Laura's murder. Shelly also mentioned this call to Bobby in Episode 0A: "Wrapped in Plastic". During his conversation with his father at 16:27 on the Blu-ray, notice that Bobby starts to play with his cigarette lighter, as he is often seen fidgeting with things. He also starts waving his hand over the flame; this may have been intended as a false clue relating to the "Fire walk with me" phrase found written in blood on a piece of paper at the scene of Laura's murder and the possibility that he was the killer. When Bobby starts shouting at his father, saying he's going to turn the funeral upside-down, his mother walks in and cheerfully asks if everybody's ready. Is she hard of hearing? She should have heard Bobby's shouting and had a more worried or shocked tone to her voice. Notice that Mrs. Briggs is wearing a smiley face pin on her coat as she steps into the room, ready to head to the funeral! At 18:09 on the Blu-ray, in the Sheriff's office, notice that a painter is putting the finishing touches on the lobby remodel after the glass foyer was seen being removed in Episode 1: "Traces to Nowhere". At 18:14 on the Blu-ray, a neighborhood watch poster is seen on the wall in the Sheriff's station. 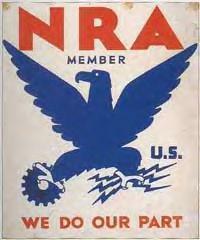 The silhouetted character appearing on the poster is the National Sheriffs' Association's "Boris the Burglar". Another poster has the heading "Is one of your classmates going to kill you this year?" This was a poster about teen violence in high schools at the time. 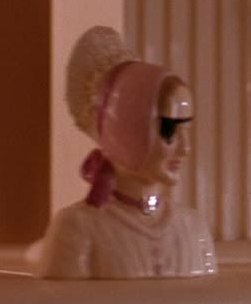 At 21:54 on the Blu-ray, the figurine of a woman with a patch over one eye, is seen on Nadine's display nook again (as previously seen in Episode 2: "Zen, or the Skill to Catch a Killer"). 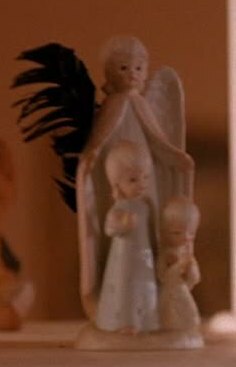 A second later, an angel figurine with one black wing is also seen! It appears that one wing has been broken off and replaced with a black feather. A third, quite odd figurine is seen last; I can't even identify what it is (this is the one Ed is looking at and asks Nadine if it's new). The sermon delivered by Father Clarence at Laura's funeral is from the Bible, John 11:25. Audrey's hair is parted on the left in the scenes immediately before the funeral and in most during. But as she looks at Cooper at 28:21 on the Blu-ray, it is parted on the right; perhaps the film strip was flipped for this shot? At 28:55 on the Blu-ray, we can see that Johnny Horne is holding a copy of Peter Pan at the funeral. Peter Pan is a 1911 fantasy novel by J.M. Barrie. Judging by the cover, Johnny is holding a 1911 Grosset and Dunlap edition of Peter Pan: The Story of Peter and Wendy. A deleted scene in the pilot episode has Dr. Jacoby mentioning Peter Pan was Johnny's favorite book to have Laura read to him, but in The Secret Diary of Laura Palmer, she writes that his favorite book is Sleeping Beauty. During the almost-fight between Bobby and James at the funeral, the camera shots go into slow-motion, with Bobby's voice being slowed down and distorted as well, in an effect similar to those seen in some appearances of Killer BOB. Note that the voice of Sheriff Truman, holding Bobby back from his charge at James, does not have his voice slowed down at that same moment, though it does have a distant sound to it. Could it be that BOB's spirit was witnessing the funeral and now feeding on the anger between Bobby and James? Truman refers to Leland as "Lee" again during the funeral scene, as he also did in Episode 0A: "Wrapped in Plastic". Immediately following the altercation between Bobby and James, Leland falls on top of Laura's casket in the grave and the lowering mechanism malfunctions, causing it to move up-and-down, up-and-down, with Leland riding it. This may be symbolic of the eventual revelation that Leland (as BOB) had been molesting her since she was at least 12 years old. In the evening a full moon is depicted. However, the actual phase of the moon on February 27, 1989 was between a new moon and first quarter. The moon phases are completely out of cycle throughout the series, the various directors simply picking nice-looking stock shots at their whim. During the night time shot of the traffic light at 31:05 on the Blu-ray, the shadow of a figure can be seen crossing the road in the bottom-left corner of the screen as the light changes from green to yellow. Is there any significance to this? Was it just an accidental catch of a pedestrian crossing the road off-camera? Could the conjunction of the shadow and light change be symbolic of a spirit "passing through" a human? At 31:39 on the Blu-ray, a cartoonish duck is seen as decoration among the plants at the booth Truman, Hawk, and Ed are sitting at in the RR Diner. At 31:47 on the Blu-ray, a "Say No to Ghostwood" flyer can be seen hanging on the wall behind Cooper at the RR. Truman's hat, perched on the edge of the table of the booth at the diner, appears and disappears in various shots. At the Bookhouse, Truman tells Cooper that the Bookhouse Boys have been meeting there for the past 20 years. Since he already stated that their job of keeping the darkness in the woods in check was being done by men before them and men before them, for as long as anyone can remember, it seems the secret society must have had a different name, or none at all, before being called the Bookhouse Boys. The Secret History of Twin Peaks reveals that Truman's father formed the Citizens Brigade during WWII, meeting at the Bookhouse, later being known as the Bookhouse Boys. Still, that only goes back 40 or 50 years. Perhaps the "darkness in the woods" recedes at times, such that the secret society ceases its functions, and then has to be reformed when the darkness resurges, taking on different names. As he approaches the Roadhouse on foot for his bartending job, Jacques sees a red light blinking on the roof and knows it is a warning to stay away. He turns and runs back down the road in the direction he came. Presumably the light was on because of the capture and interrogation of Jacques' younger brother, Bernard, by the Bookhouse Boys. But who turned on the red light to warn Jacques? Who knew that Bernard had been compromised? Was it one of the Bookhouse Boys? At 36:31 on the Blu-ray, notice that there is a poster or magazine page or something of a poodle pinned to the wall next to the phone in the Johnson kitchen! Is it Shelly's? Leo doesn't seem like the poodle type! 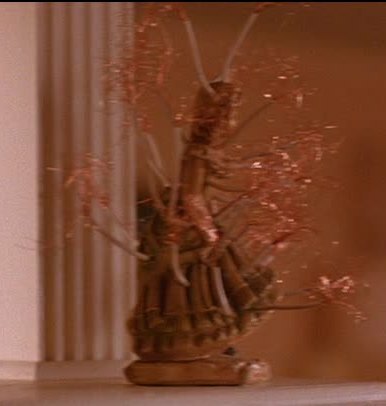 There is also a statuette of a poodle on top of the cabinet where Shelly is hiding the bloody shirt and gun. During the scene above, Leo is using a knife to carve out the sole of a boot. No explanation is given here, but in Episode 14: "Lonely Souls", we learn that Leo had hidden a microcassette tape in the sole of a boot. During the same scene above, we get another instance of a character wearing a sweater that has a design similar to the Owl Cave glyphs. Jacques calls Leo and asks him to pick him up at the Cash & Carry. Cash & Carry is a warehouse grocery chain in the northwest United States. The Secret Diary of Laura Palmer reveals the store is just a couple blocks from Leo's house. As Leo leaves the house to pick up Jacques, Shelly asks where he's going and he rudely says, "You don't need to know." In the next episode (Episode 4: "The One-Armed Man"), Bobby says the same thing to her. The gun Shelly hides in the back of the cabinet is a Walther PP. At 37:10 on the Blu-ray, notice that the Johnson kitchen has a large silver trash can sitting under the telephone. Maybe that's what they regularly use as a kitchen wastebasket! It's possible it's there for construction waste, as the kitchen is still under remodel. 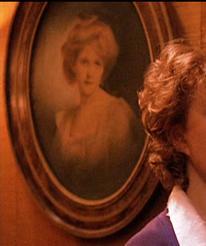 Who is the woman in the portrait on the Martells' wall at 39:58 on the Blu-ray? Is it a Martell or Packard ancestor? At 40:07 on the Blu-ray, notice that the objects on the false bottom of the storage stand in Catherine's bedroom are all securely fastened to the board when she lifts it to hide the second mill ledger underneath. It seems like a good way to point out your own hiding place if all the objects on the false bottom are not real! Hawk tells Cooper that Blackfoot legend tells of several souls that exist in humans, such as the waking soul that gives life to the mind and body and a dream soul that wanders to faraway places and the land of the dead. "Blackfoot" refers to the Blackfoot Confederacy, a conglomeration of three Canadian Indian tribes and one American tribe in Montana. I have not been able to confirm the particular mythology described by Hawk among the Blackfoot. Hawk himself is implied to be of the Zuni tribe in New Mexico, according to the Twin Peaks card set published by Star Pics, Inc. in 1991, but The Secret History of Twin Peaks states that Hawk is a full-blooded Nez Perce, a tribe native to the northwest. As Leland begins to break down on the dance floor at the Great Northern at 45:33 on the Blu-ray, the music putters to a stop as if it's a live band playing, not a recording. We don't see a live band, but there could be one present "off camera".